This morning, I went for it. 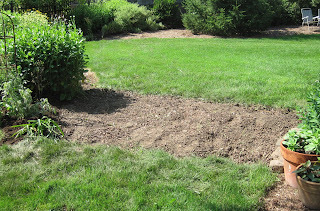 I grabbed a shovel, rake and digging fork and cleared out the section of the perennial border that is being taken out to be replaced with lawn. Here's the before picture from earlier in June. 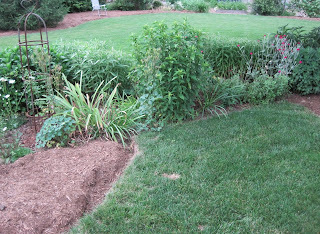 Here's the after picture this afternoon after I dug up the perennials that were there. Perhaps I should not have chosen a day when the temperatures were forecasted to get close to 90 F, followed by more days of the same, to move perennials. But I did. I just decided to do, but I don't recommend that others do the same. Do as I say, not as I do. Carpe hortus... seize the garden. The plants I moved this morning now look pretty tired, wilted, and droopy in the late afternoon sun. I'm hoping a little more water and a cool evening will help them some. I did cut them back when I moved them and do realize they may not recover. Or they will look bad for most of this year but recover in the spring. It was a gamble, but looking over the plants I moved, I realized that those that were "one of a kind" were not so rare that I would lament their passing, and others were one of multiples. If they don't make it, I know where I can get more of them next spring, either in my own garden or the gardens of one of my sisters. I'll wait until early fall to sow grass seed there. I would go ahead and seed the grass. We've done it in the middle of summer and it's turned out fine. You just have to remember to water it, but you're out in your garden every day, so that's not a problem. Or sod...it's pretty cheap here, don't know about there. I just know I couldn't stare at bare dirt for months, plus you know weeds are going to invade. I keep eyeing up my gardens with major changes in mind. I'm of the mindset: do it when you're inspired/motivated/able. To heck with the season, and so what if you have to water a tad more, y'know? I'm impressed you braved yesterday's heat to accomplish so much, Carol. We've had so many rainstorms lately, that my garden has turned into mud. I'm ready the seize the moment to get some projects finished--whenever it dries out!